Weddings are a major event in life, and you want to work with people who do a great job, to make sure your day is as special as it could be. Our Wedding limousine service is not just a pick up and delivery service in a luxurious and elegant ride. It goes far beyond that, taking into consideration your personal preferences, across the board. If you would like special music, decorations, and even champagne, we can accommodate it all, to make your day that much more special. Our luxury stretched limousines have a sophisticated style, elegant lines, full powered amenities inside, extra comfortable seating, privacy windows, and they come with the service of courteous professional drivers. They are ideal for making that perfect arrival at your ceremony and reception, leaving the lasting impression of living happily ever after as you ride away in luxury. Our wedding packages start with 3 hours of service, and complimentary champagne, soda and water. We also work with you and your florist/planner to add the specific decorations you need to blend into the other accents of your ceremony and reception activities in a beautiful, and seamless way. It adds a 'meant to be' fit with the wedding, as the bride and groom are also meant to be. Your chauffeur, who is trained on wedding etiquette, will arrive with your clean, customized and beautifully decorated limousine promptly, in a formal black tuxedo, ready to put forward the best effort to make your day beautiful. Not just in driving, but in fluffing your gown, and boosting your flowers, if you wish. And while you are in your ceremony, your chauffeur will be working in the limousine preparing your champagne toast! We deliver the perfect service for the perfect day. Our selection of chauffeured limos in South Florida is available for your wedding limo service, with the luxury, performance, and treatment you want for your special day. You simply can’t go wrong with us. If you have any questions or concerns, or would like assistance in selecting the South Florida limo service that is right for you, please call us at 954-600-1562, we look forward to assisting you. Book your limo service now! Please call for details on our Wedding Limousine Packages in South Florida. 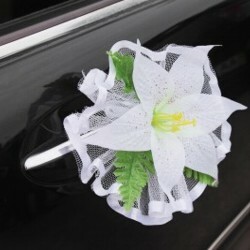 Make sure you reserve your bridal limo service while limos are still available!